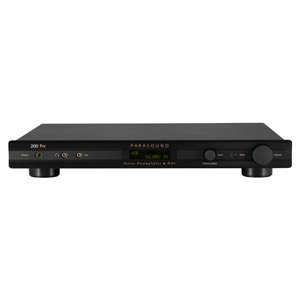 The Parasound NewClassic 200 Pre two-channel preamplifier represents a new generation of affordable, high performance audio products from Parasound. At the heart of the 200 Pre is an all-analog signal path which includes analog bass management with high and low pass outputs. 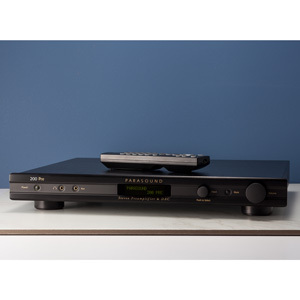 The NewClassic 200 Pre has connections for just about any source including an MM/MC phono input, home theater bypass, USB, Coax, optical and a front panel Aux with an automatic 12dB gain bump. 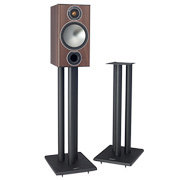 The built in DAC features a Burr-Brown IC, and the circuitry is pulled directly out of the award-winning Halo P5. Convenience and Ci features include turn-on volume preset, a favorite volume setting, two-way RS232 serial port, rear panel IR input and 12V output trigger. 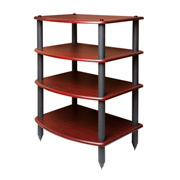 The front panel LCD display allows the input names to be changed and provides for easy control. 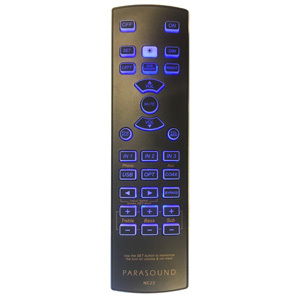 The back-lit remote provides adjustment of the bass, treble, subwoofer trim, subwoofer on/off and balance. 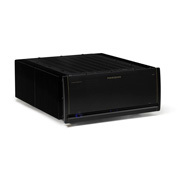 The Parasound NewClassic 200 Pre is ready to bring you maximum enjoyment from your digital music files. 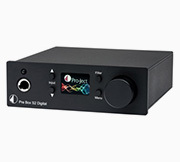 It incorporates a very high quality state-of-the-art DAC using circuitry from the highly regarded Halo P 5 preamp. 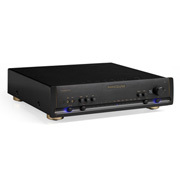 This DAC can process a wide range of digital sources with its coaxial and optical inputs accepting up to 192 kHz rates, and the USB input accepts up to 96 kHz. 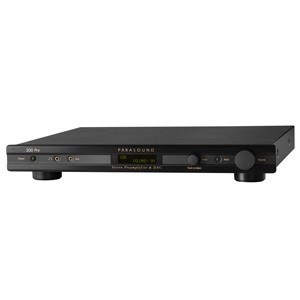 The NewClassic 200 Pre's Cirrus Logic Digital Receiver scrubs the digital clock to attenuate jitter not only for the USB but for all inputs. 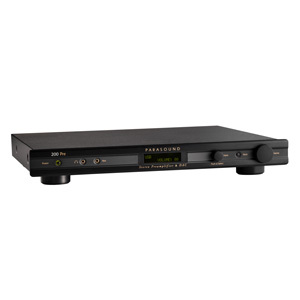 This enables its acclaimed Burr-Brown PCM1798 DAC to achieve outstanding, natural sound quality for all of your digital sources. The 200 features a pure analog signal path for the analog inputs plus input level matching (offset +/- 8dB per input) to keep input levels similar from your source gear. 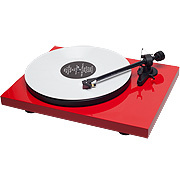 The analog inputs consist of one phono in, two line level inputs, and L, R, and subwoofer bypass inputs. A front panel 3.5mm mini jack is perfect for portable audio players or smartphones. 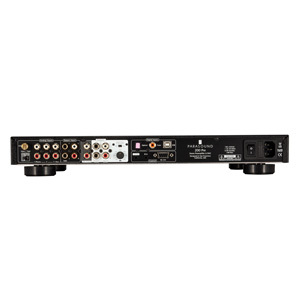 The outputs consist of full-range stereo preamp output jacks, a full-range mono preamp output jack, and an 80 Hz mono low-pass subwoofer output jack. 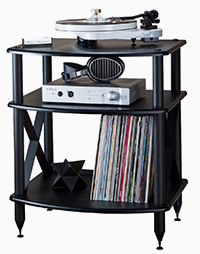 And since vinyl has once again become a big part of home hi-fi, Parasound includes the same high-quality built-in phono stage that is used in the Halo P 5 preamp. 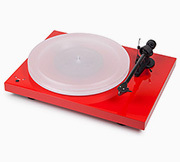 The phono input is compatible with all moving magnet cartridges, and virtually all moving coil cartridges, with a 100 ohm/47k ohm switch to select the appropriate load impedance matching. Headphone jacks are an afterthought on many other manufacturers' hi-fi gear, but this has never been true of Parasound. 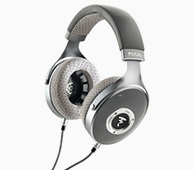 The 200 Pre includes a newly designed dedicated headphone stage for the best in private listening with your favorite pair of 'phones. 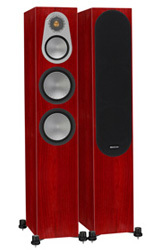 The 200 is the perfect partner with your home theater system. The left-channel, right channel, and sub bypass inputs simplify integration with a surround sound system or a Sonos Connect. Analog bass management includes a 12 dB/octave high-pass crossover, adjustable from 20 Hz to 140 Hz plus an 80 Hz mono low-pass subwoofer output.